Nestled on this large lot is a unique home with picture windows to let in light and take in the views. 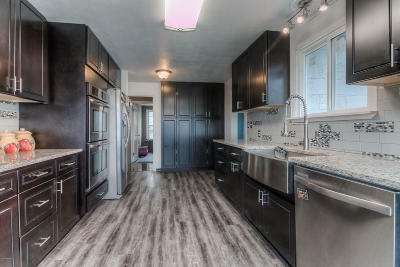 Newer kitchen has stainless appliances including a double oven, granite, decorative tile back-splash, a large pantry and breakfast area that is surrounded by windows. The sprawling dining room looks onto the covered porch. The living room features more windows, a fireplace, wood flooring and a door to the covered patio. Master bedroom has two closets, built-in cabinets and a slider to the patio. There is a large fenced backyard, garden area and shed.